Flower broad, c. 35 mm across, greenish to purplish red. Dorsal sepal obovate, 19–30 mm long, 14–17 mm wide; osmophore 1–2.5 mm long. Lateral sepals erect and curved forwards, 17–25 mm long, c. 4 mm wide; osmophore c. 1 mm long. 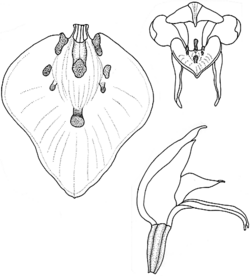 Petals ovate to lanceolate, 17–23 mm long, 8–11 mm wide, incurved close to labellum. Labellum broadly cordate, 14–18.5 mm long, 12–16 mm wide, with 1–6 linear to terete, erect, dark calli on the basal two-thirds, the largest c. 4 mm long. Distribution and occurrence: Grows in grassy forest; particularly common in montane and subalpine regions; occurs south of the Brindabella Ra. Forms rare hybrids with C. trapeziformis.